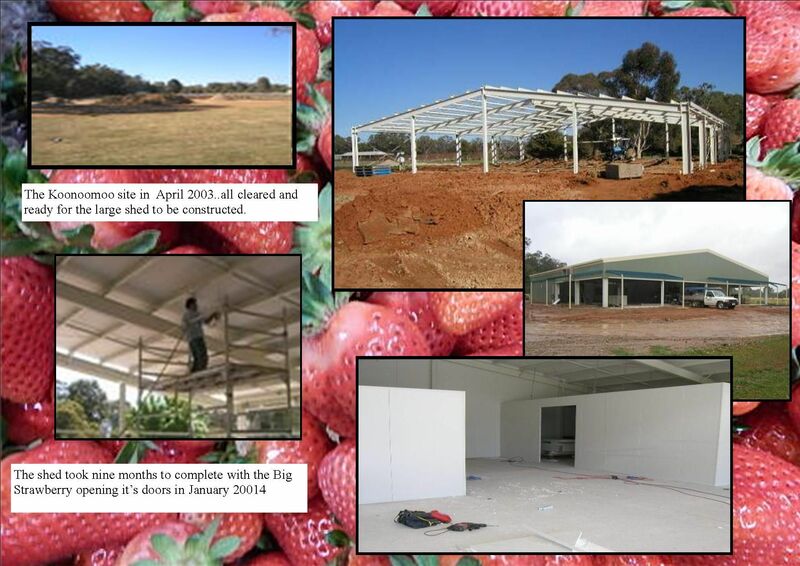 The construction for the Big Strawberry icon commenced in September 2004 with Cobram Plumbing making the steel frame and the Big Strawberry team members preparing the steel mesh for the next step. Competition Kyaks then completed the fibreglass with paint and panel bringing it to life with it's Monza red colour. " It was placed into to its home in Febuary 2005 and concreted tightly into place. To make the Big Strawberry icon it took 540 metres of steel and layers of fibreglass. The icon stands at over six metres tall and is 5 metres in diameter. It is painted Ford Monza Red as Darren, one of the owners of the Big Strawberry, is a Ford fanatic.